Here at Quote Roller, we’ve always used a lot of electronic forms – after all, our service is full of them. As a rule, every form takes quite a while to code, since you have to fill it with values, add validation scripts and make sure it looks good on your page. Now that we know about 123ContactForm, we look at this task from a seriously different angle! As the name suggests, 123ContactForm makes the process of creating online forms of all types a breeze and basically narrows it down to a simple and straightforward 1-2-3 sequence. It can be a simple “Contact Us” form or a much more complex form with multiple selections and a payment mechanism – 123ContactForm will handle all of them. I have spent some time with this online form builder and really liked how it covers every aspect of form generation: from defining fields to enabling credit card payments for your form. Not only does this contact form generator support standard controls, but lets you use other handy fields, such as Google Maps and file and image upload elements. Custom forms that you create with this online form builder can be published to a number of formats, including floating buttons, iFrames or direct links. 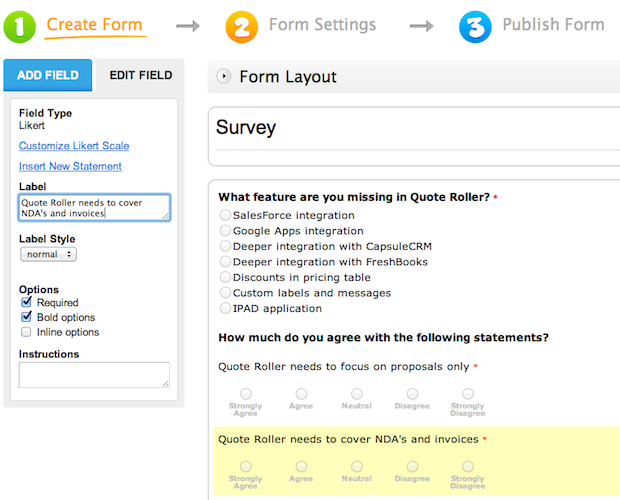 You can even publish your forms to Facebook, WordPress and Blogger with just a couple of clicks! The results of your form submissions can be viewed on the dashboard as activity logs and charts, thus making it a lot easier to understand how well your sales, donations or submissions are going. One of the coolest things about 123ContactForm is its ability to interface with lots of other services and applications in a meaningful and efficient way. At the moment, you can configure Google Docs, MailChimp, SalesForce, Google Groups and WebHooks to get your form submissions. This wide support of online services allows you to create forms that will break every submission into separate parts and send them to corresponding destinations: email address to SalesForce and MailChimp, form data to a spreadsheet stored in Google Docs and the name of the form submitter to a Google/Yahoo group. And that’s not all – you can add new services and applications to 123ContactForm. Just configure the connection settings and you are good to go! Finally, this contact form generator also works like a charm for creating paid sign-up forms, paid subscription forms, e-commerce order forms and any other forms that require a secure payment interface. The service currently supports PayPal, Google Checkout and Authorize.net, a set covering most countries and regions. Needless to say is that every customer sees a detailed receipt prior to placing their order. We really appreciated the practicality of the service and its actual, not just manifested, ease of use. The WYSIWYG editor helps immensely in creating multi-field forms and the abundance of data output and integration options lets you use forms in ways you haven’t even considered before. This said, take our advice: if forms play an important role on your site or sites you work on, make sure to try 123ContactForm!